Jewdar is certainly not the first to note the similarity between the Dwarves of the Hobbit and the Jews. We certainly didn’t see it when we read the book as a child, but having just completed Peter Jackson’s trilogy, we have to say that what truly impresses us is the way that Tolkien, way back in 1937, could both compassionately capture the tragedy of the Jewish people’s exile, as well as dispassionately and quite presciently capture the degree to which the end of that exile would spell tragedy for another people. As noted elsewhere (what, have you already forgotten about that link above? 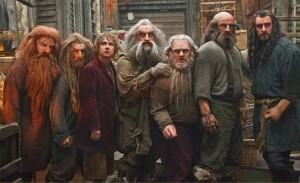 ), the Dwarves are a people driven from their homes, forced to wander the world, where they make their living as craftsmen and smiths, favored for their skills even as they are often despised for their clannish “otherness.” But what comes out in The Hobbit: The Battle of the Five Armies [spoilers coming up for those who don’t know anything about Hobbits or the Hobbit] is that, when Thorin finally succeeds in reclaiming his home, he immediately forgets all that pathos, the sorrow of the exile, and completely turns his back on those who have been rendered homeless by that reclamation. Although he has all the wealth in the world, he is unwilling to share with those with nothing. I will not say what happens after that, but suffice it say that it ain’t good for the Jews. We don’t know when this movie is supposed to be released in Israel, but we hope it’s before the elections.